The popular indie game gets even bigger (by going even smaller) in Funko Cuphead Mystery Minis! While collectors obviously don't know what's waiting inside each sealed box, another mystery comes with the various exclusives, and where to find them. Working with 1930s-style animation, the many characters of Cuphead transition quite well to the miniature vinyl world. 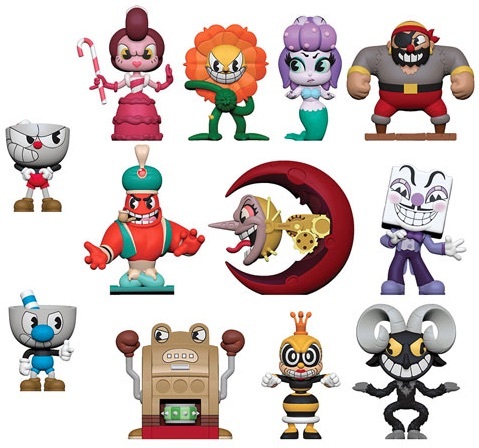 Of course, there's Cuphead (in red) and Mugman (in blue), who both headline the Funko Pop Cuphead set, as well. There are also many new options and exclusives to be aware of as you attempt to complete the set. Buy Cuphead Mystery Minis Boxes on Entertainment Earth. Issued in three different versions, the grand total is 18 figures. The main Funko Cuphead Mystery Minis release offers Baroness Von Bon Bon, Cagney Carnation and the Slot Machine-frog hybrid formed by Ribby and Croaks. On top of that, GameStop exclusives include Beppi the Clown, Chauncey Chantenay (the psychic carrot, aka Psycarrot) and Cuphead in an airplane. To obtain the Grim Matchstick, Mugman in plane and Werner Werman figures, a trip to Hot Topic is required. Buy Cuphead Mystery Minis on Amazon. Cuphead Funko Mystery Minis set of 4! Cuphead FUNKO Mystery Mini KING DICE Vinyl 1 24 Figure Brand NEW! Free SHIP!!!! Is Psycarrot’s name really Chauncey Chantenay? According to Funko it is.